0h!m1gas is an artistic research and audiovisual installation that approaches the self-organization in ants as a cybernetic system with emergent acoustic manifestations. Reference this essay: Shen, Kuai. “Oh!m1gas.” In Leonardo Electronic Almanac 22, no. 2, edited by Senior Editor Lanfranco Aceti, and Editors Candice Bancheri, Ashley Daugherty, and Michael Spicher. Cambridge, MA: LEA / MIT Press, 2017. 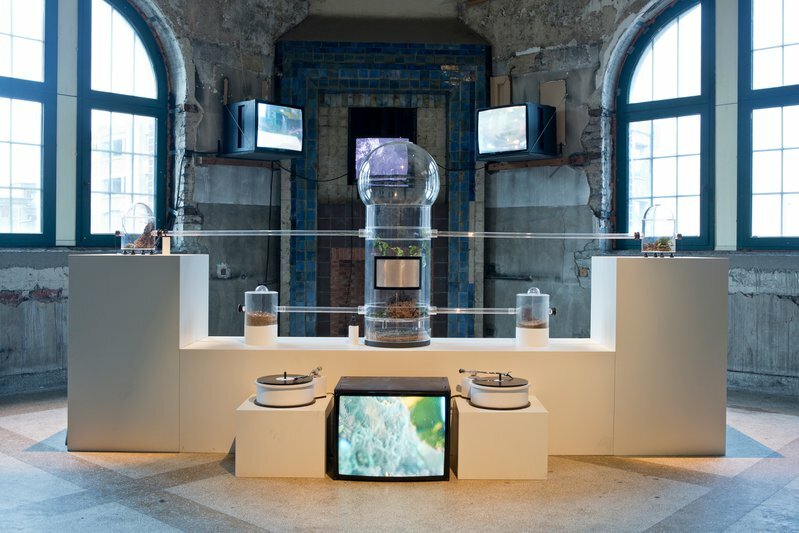 The installation consists of two main components: the biological (composed by ants, fungi, and vegetation) and the technological (composed by turntables, microphones, video, and computer). The aim of this artistic research is the exploration of the stridulation phenomena of ants as a modulation mechanism in their self-organization, which can be perceived as a multi-network of parallel tasks regulated by local interaction and feedback. The source of inspiration for this sound-reactive installation is based on the functional resemblance of the turntable, as a cultural artifact for sound production in humans, with the stridulatory organ of several eusocial ants as a biological artifact for social communication. 0h!m1gas is a reactive soundscape which exposes the potential mutualism between technology and biology, building upon discourses of insect media and sociobiology applied to the behaviors of ants. The concept of the installation circles around the hypothesis that human technology can be assimilated by insects, particularly by ants. My artistic approach is inspired by the first and second wave of cybernetics proposed by Norbert Wiener and Heinz Von Foerster, respectively. My empirical practice makes use of the autopoiesis from Humberto Maturana and Francisco Varela to reflect on the emergence of complexity in ants’ social system, approached as a superorganism that learns to adapt to the perturbations of the artificial environment in which they live. It is relevant to state that my research and interest is focused on the production and transmission of the context-based acoustic vibrations of ants of the species Atta cephalotes. Therefore, in order to embrace how cybernetics can be applied to this biological sound phenomenon, we have to start by defining what stridulation is and how humans can relate to it. Stridulation is a bioacoustic phenomenon that can be translated into a stimulus to instantiate an action. Stridulation is energy as vibration produced by a unique microscopic organ, known as the stridulatory organ, which is located between the rear and torso of the ant’s exoskeleton. Studies on the stridulation of ants point out that the primary function of the stridulatory organ is the production of information in the form of vibrations, which I emphasize as energy in my work; thus, ants do not own a specialized hearing organ. It is stated, rather, that they perceive those vibrations with their legs. Therefore, what ants perceive are vibrations in the form of energy that needs a material in order to be transmitted. This leads me to believe that the ant body is a resonating body, which is enhanced by the stridulatory organ as an artifact for encoding and decoding energy. The whole exoskeleton of the ant becomes an apparatus for resonance. In other words, the vibratory information, which is encoded as an acoustic signal, is only received and decoded by another ant if both sender and receiver are in contact with the same resonant material that serves as a channel for the transmission (e.g., leaves, twigs, soil). Figure 1 - Scanning electron micrographs of the stridulatory file of a Pachycondyla apicalis species complex worker. (A) General view of the stridulatory file, (B) detail of the ridges showing the interface between the fine structure of the file and the surrounding cuticle, and (C) detail in the medial portion of the stridulatory file, showing the inter-ridge distances. © Ferreira et al., 2010. The image is part of Kuai Shen's open-access article distributed under the terms of the Creative Commons Attribution License. Used with permission. The vibrations produced by the stridulatory organ travel along the body making the ant's mandibles vibrate like the cutting blades of a razor machine. This image can portray ants as social resonating agents. Ants have a tarsus with claws at the end of every leg, which enables them to hold onto almost any surface. The tarsus is covered with microscopic sensitive hairs that enable ants to sense the material they touch. As a result, this suggests that ants perceive other levels of intensities regarding vibrations transmitted through resonating materials and bodies. Stridulation makes the ant body resonate acting as a pneumatic mechanism, specifically when it comes to cutting green materials or excavating heavy terrain. It is energy that informs and sets materials in motion. In the case of highly evolved ants, specifically leafcutter ants whose workers are polymorphic, the stridulatory organ develops naturally according to caste specialization. For example, minims, or minor ants, will develop smaller stridulatory organs compared to majors and soldiers who develop bigger organs. Based on my recordings, the signaling pattern of stridulation varies according to the ant’s size but also according to the structure of the organ—for not every organism in the colony is born with the same physical features, a finding which Ferreira et al. corroborate. 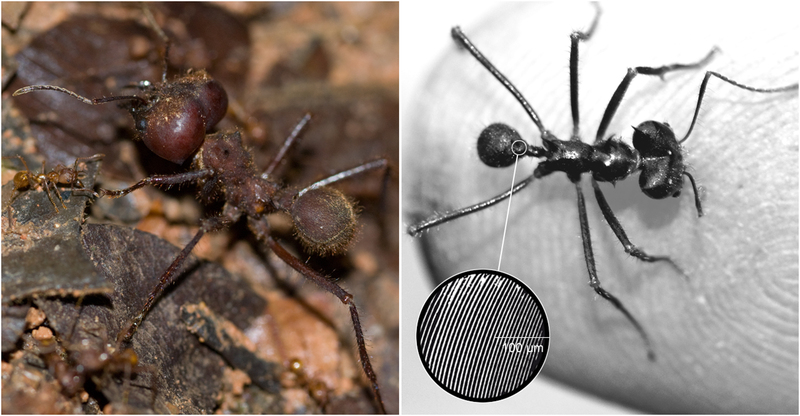 The stridulating frequencies of Atta cephalotes specimens oscillate from 2-5 kHz, documented for minors (about 4 mm of body length), to a maximum energy of 38-46 kHz, documented for supersoldiers (about 18 mm of body length). 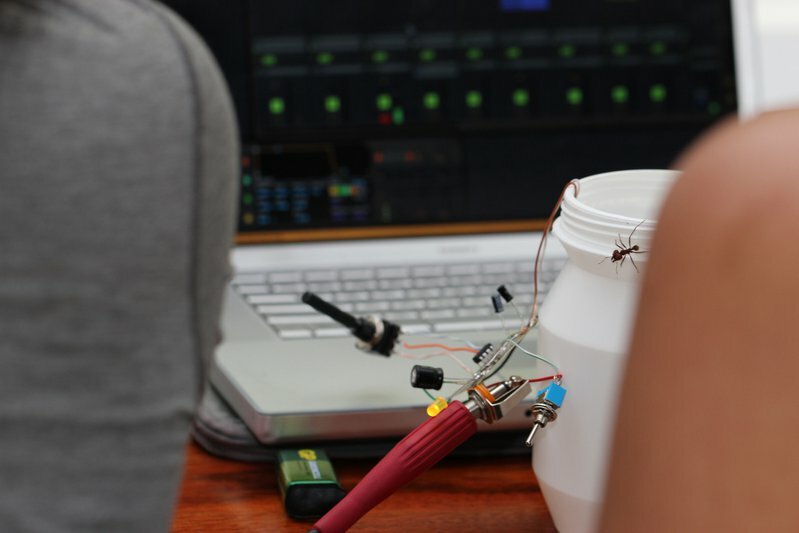 These results are based on indoor recordings isolating the ants inside custom-made polystyrene casings, and were done in the PUCE scientific research station located in the Yasuni national park of Ecuador, as well as in my studio, using pre-amplified piezo sensors. Figure 2 - Left: a major soldier and a minor of the leafcutter ant, Atta cephalotes. This picture shows the polymorphism in this species. Right: the location of the stridulatory organ of a major of the same species, which was trying to cut my finger. Photographs were taken in the Yasuni rainforest in Ecuador. Photographs by Kuai Shen. © Kuai Shen, 2011. Used with permisson. We have to understand, emergence is the link between the turntable as a cultural artifact and the stridulatory organ as a biological artifact. Turntables were not originally meant to be used for scratching; they were created for sound playback as a decoder of media. Yet, this cultural artifact was rediscovered as an instrument for musical expression. For me it was clear that stridulation and scratching had to be experienced, explored, intertwined, and remixed. The sound energy produced by these simple acoustic mechanisms has the potential to develop into complex forms and act as a communication portal between humans and ants. Any object, material, or organ that produces sounds can potentially become a musical instrument depending on the context and intention of the expression. We do not need to define music in order to know what this means. If we understand that music is part of our culture and that it is also a form of social communication, then the turntable as analogous with the stridulatory organ can be utilized to explore the intensities of expression in both humans and ants. Ants are eco-engineers who impact ecosystems just like humans. Their relation to us as carriers of materials, transformers of topologies, and creators of opportunity is more than a coincidence. They might be anatomically different, but their collective power to create supercolonies rivals our hierarchical organization of states and nations. Furthermore, they invade human habitats, which are constantly changing and shifting according to our desires. Therefore, ants have been adapting to the Anthropocene era with success, and while doing so they have been colonizing new territories, disturbing ecosystems, and displacing other species. From this, we can infer that ants and humans can transform reality. Ants and humans can be perceived as a manifestation of interspecies agency; this agency can transform physical and digital territories mediated by the technology on which humans depend. To a great extent the goal of my artistic research with ant stridulation relates to the experience of interspecies relationships and their social implications. Interspecies relationships are important because they affect the territories of established ecologies and artificial systems, thus creating an interdependence between technological media (human artifacts) and insect media (biological organisms). To explain, territoriality is approached in my work as the definition of an autonomous system in space constituted by the communications of the individuals of an organization that occupy that space. This is my interpretation of what Maturana and Varela described as an autopoietic system. Human settlements invaded by ants can be defined by the transmission of invisible messages by means of pheromones and stridulations. Figure 3 - Graphic representation of the multicomponent communication in ants, imagined as invisible atmospheric fields created by the combination of pheromones and stridulations. Graphic designed by Kuai Shen. © Kuai Shen, 2011. Used with permission. Hence, ants are able to construct atmospheres of scents and acoustic soundscapes, enabling the formation of a social network that the limited vision and hearing of humans cannot easily perceive. Nevertheless, this phenomena can be visualized and augmented by means of technological devices that connect to a computer—like contact microphones, video cameras, and turntables—in order to process biological information. Consequently, my research has aimed toward the computable augmentation of the sounds and movements of ants, and the subjective interpretation and affection of stridulation in relation to human culture. 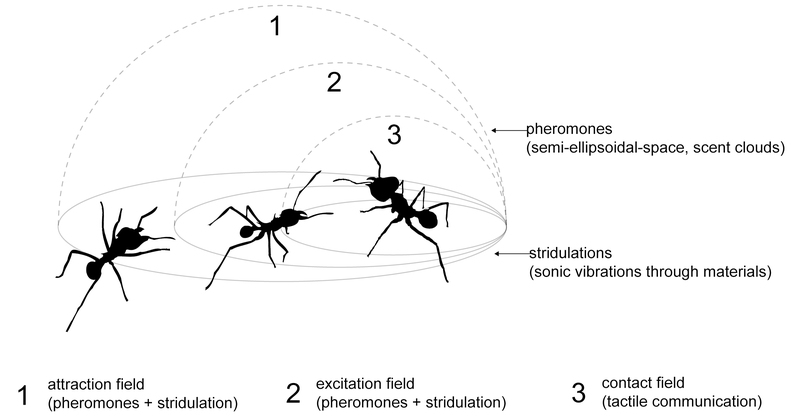 Stridulation in ants, as a form of social communication, is an amplification process that can be approached as a feedback system that allows the local transmission of vibratory signals from one colony member to another. It is actually a reinforcement of pheromone messages within the colony's communication network. Pheromone emissions are still the main language of ants. But this semiochemical form of communication needs to be reinforced by another gesture depending on the situation, as myrmecologists Bert Hölldobler and Edward O. Wilson stated: “when nestmates are trapped in such a way that the only possible transmission of information is to stridulate for help.”  Every ant species that has a stridulatory organ produces distinctive frequencies at different intervals. Research by Ferreira et al. has revealed there is a degree of specialization in the way the stridulatory signals are produced, with morphological distinctions for every organ of the Pachychondyla workers they studied. What this points out is that the vibratory signals complement other social expressions, yet stridulation can also appear as a singular gesture if the case requires so; isolated stridulations appear when there is a state of emergency to convey. Ants can express themselves individually, and by doing so they amplify a message to the colony. When ants decide to stridulate, the sonic effect is a sound wave that expands because it activates a chain reaction amplified by all the members of the colony. All levels of labor division in the colony get alerted. As a consequence, the speed and effectiveness of workers finding the right job to do increases. The allocation of tasks for the rest of the unassigned workers, undecided workers, or workers who were recently recruited to the scene is then achieved via self-organization. What this conveys is that the ant colony is a cybernetic organization, where individuals are in permanent contact with each other and exchange information based on proximity and local interaction. Each single ant perceives and decides on its own which task to do. Therefore, an ant colony generally responds to stress and perturbations by amplifying information through parallel operations where auto-regulation from chaos to order works by means of feedback loops; if there are more ants executing a task than ants running around looking for the source of the problem the system achieves temporary balance. Figure 4 - My Atta Colony and Their Garden of Fungus. Photograph by Kuai Shen. © Kuai Shen, 2013. Used with permission. When there are too many workers performing the same task, the excess of ants doing one job tends to cancel out over time by moving on to the next available unattended task, so that at the end balance is restored. Ants cannot achieve balance without the amplification of messages originating from an initial perturbation. At the beginning it may seem that ants are chaotic in their decisions, saturated and overcrowded, but after a while the system achieves knowledge of itself and manages to balance and self-organize. The regulation in the ant system exists for every action because there is a response due to the number of workers which act as problem-solvers always trying to find something to do. They are organisms within a greater social organization. Ants could arguably be seen as trivial machines, yet they do adapt to the conditions of their environment, suggesting there is a level of perception, affect, memory, and behavioral actions which challenge the human understanding of social collectivity, but which can also be modeled to help humans solve other problems. The ants' network of possibilities should be viewed as networks of relations, a milieu enhanced by pheromones and stridulations. This picture of ants’ communication system becomes an excellent model coherent with human made media, i.e., the expansion of technology. We can refer to Gilles Deleuze and Félix Guattari to observe the expansion of the ants as a rhizome; for me, the cybernetic system of ants became an artistic model because it is a remarkable example of natural multiplicity characterized by connection, heterogeneity, and rupture. Ants create networks in the complex natural milieu they inhabit connected by a multiplicity of relations. This has served as inspiration for the creation of the ant colony optimization algorithms (ACO), which optimize urban transportation systems and provide solutions to the traveling salesman problem—a mathematical problem where the goal is to find the shortest route to pass through each point only once. In this way, ants have turned into instruments for science. Technology belongs to humans who use it to deterritorialize themselves. We connect by invisible threads in front of the computer without ever leaving our homes or workstations. Yet we amplify messages via online social networking. We resonate. The same characterizes the world of ants. They use their own recourses to expand and invade other territories, in most cases also aided by human transportation. This means ants can define new territories, too. Ants succeed as eco-engineers because they create opportunities for other creatures. By disrupting ecosystems they invite plants, fungi, and insects, they incite collectivity to emerge. The same collectivity manifests in the technology of humans. When individuals in front of the computer share ideas through networks, they promote the formation of an autopoietic collectivity that exists and self-organizes by the inputs of its users. Humans sharing information behind the screen also become instruments of collectivity. We create our own world out of the input we absorb from the cybernetic chain of events latent in the surrounding environment. Social beings like ants react according to this resonance of events. Individuals select and filter what matters to them. If we compare ants to simple machines preprogrammed to compute and which can identify a binary language, then we end up having robots or artificial agents. This is the case in the ant colony optimization algorithm. But if we add a set of social algorithms to these machines and an environment with conflicts, then we can play around with the idea of potentially creating agents that have the capacity to organize themselves. Figure 5 - A major of Atta cephalotes approaches the amplified piezo. Part of the [Eco]mimetismos workshop given by the author in the Otonga reserve in Ecuador in August 2013. Photograph by Kuai Shen. © Kuai Shen, 2013. Used with permission. The principle of the creative resultants, introduced by Gordon Pask and Heinz Von Foerster, postulates the product is not just the sum of the elements involved, but represents a new creation—something genuinely different that appears every time we do the same equation. Even though ants can be compared to intelligent machines and are approached as such in behavioral models, they are in fact simple essential agents acting sometimes erratically, like humans, so that sometimes they create things that are not expected. They are constantly changing, resonating, and reading the signs from the environment in search of invaders, prey, or predators. Ants establish a nonverbal communication with their ecological milieu, and the first signal to alert the colony of an unwanted presence is the most simple and instinctive one: to sound the alarm, to stridulate. We can see that social behaviors in ants have a relationship with the environment. Everything in this planet is interrelated and contains potential information that just needs to be amplified and experienced. Diverse arrays of bioacoustic strategies exist in the world of living organisms. We are compelled to create a relationship with the environment in order to learn how to interact with the resonating material of the surroundings. Rhythms and beats, clapping, shouting, singing, drumming, stridulating (in ants), and scratching (in humans) represent information that contains messages in need of amplification. Living organisms take advantage of instruments to create vibratory signals that inform, alert, and convey meaning. A fundamental dialect between milieus and living beings has to be created in order to materialize relationships. Hence, my interest was how to play the same stridulations using a human-made artifact so that both the ants and the public can relate to the soundscape. Therefore, I composed vinyls with the stridulations of my colony of Atta cephalotes with the purpose of being scratched by the turntables of the installation, which are driven by the movement of the ants themselves who in turn are constantly surveilled by the cameras. The digitalization of movement and the transmission of this bio-data are a product of a dynamic system, which is programmed using a library of computer vision algorithms for Max Jitter. This is the emergence of complexity from a concatenation of events that trigger something bigger than the sum of its parts. By enabling complexity to grow out of the unforeseeable social organization of ants, the turntable transforms into an artifact for the translation of energy and the transmediality of ideas through an open experimentation with scratching. Figure 6 - Sketch of the technical setup of 0h!m1gas. The lines show the connection of information and the arrows show the directions of transmission. Designed by Kuai Shen. © Kuai Shen, 2011. Used with permission. The acoustic soundscape of 0h!m1gas is effective; it carries along memories for the listener and our brains start to connect and reconstruct past experiences so that a temporary meaning emerges in relation to a specific moment in life. This sonic effect is called anamnesis—sounds transform into feelings and recall memories. To this extent, sounds evoke in our brain an association of past experiences, that is, internal processes we cannot define objectively. This is what makes the artistic research in 0h!m1gas so fascinating and compelling because all listeners have their own interpretations of the soundscape produced by the scratching of the ants‘ stridulations. This is where the art of amplifying the sounds of ants with the aid of an instrument for sound production plays a relevant role in the realm of interspecific communication: the amplification of stridulation, an acoustic expression which is naturally concealed from human hearing, into airborne sounds that can be heard and experienced. Consequently, my colony of Atta cephalotes produced a fantastic concert composed of a rich variation of vibratory sounds that bring the listener into anamnesis: http://kuaishen.tv/stridulations.mp3.To this extent, the system in 0h!m1gas materializes a sensorial network able to establish a conversation of a different kind. Conversations affect and impulse the transitory states of social beings. A conversation is indeed bioacoustic communication, for it is a natural form for sharing information. Gordon Pask introduced his conversation theory to approach an architecture that can change and adapt to its inhabitant‘s movements. His discourse rests on the succession of a dialogue between space and inhabitant; 0h!m1gas takes on Pask‘s rhetoric in which spaces are transformed (the nest habitat) according to the position of the inhabitant (the ants) and informational ecologies are created provoking in the actuating inhabitants a pleasure for exploration, cooperation, and self-organization. Figure 7 - 0h!m1gas: biomimetic stridulation environment, exhibition at Manifesta 9, the European biennial of contemporary arts, in Genk-Belgium, 2012. The installation was exhibited in the director’s office of the Watershei venue for four months where the ants managed to cultivate a second fungus garden. Photograph by Kristof Vrancken. © Kuai Shen, 2012. Used with permission. 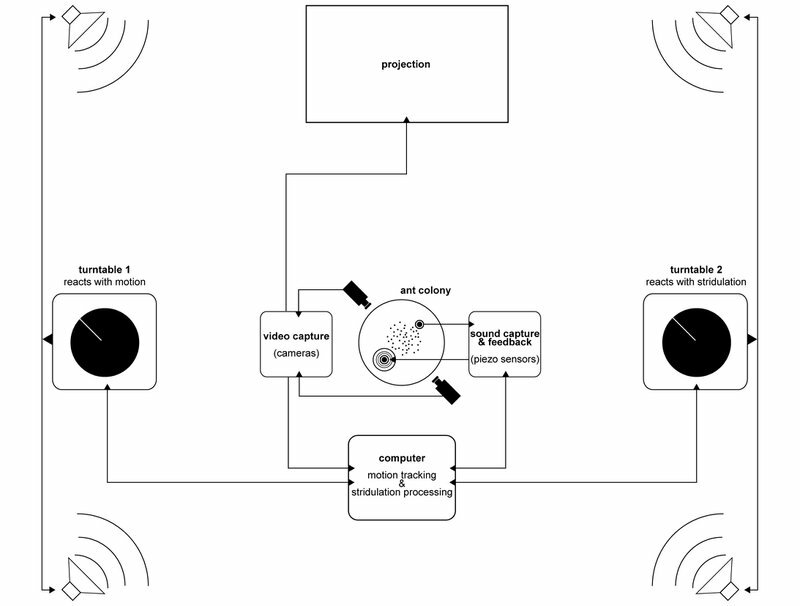 Bioacoustic communication stems from the complex society we belong to; it is an emergent product of active information exchange and feedback mechanisms within the network of living organisms that can foster new experiences. My interdisciplinary work reveals that ant media should be understood as a natural milieu of social organization, cooperation, and intense relationships. It can be experienced as a cybernetic ecology because the ants appropriate this artificial environment and adapt to the presence of surveillance cameras and contact microphones as part of their territory. Beyond all the definitions that can be attributed to my work, 0h!m1gas is, for me, a cybernetic installation that amplifies for the sake of human perception the communication network of ants by expressing emergent forms of music—a soundscape that explores the relation of our human-made technology with insect media. How can we produce a self-organizing milieu where the artificial and the biological can complement each other? Do we really need to use a self-organized machine, or is self-organization itself such a unique social trait that will always emerge when species and artifacts confront each other? These two questions are explored in my piece, yet the answers are not definite. As social beings, we rely on social learning that depends on every individual‘s cultural background and education. This influences the perception of sounds. As a result, the immediate environment plays a major role in the intensity of interactions and conversations. Likewise, stridulation is context specific for ants, which means the contextual sphere in which everything takes place for that ant plays a major role in its perception of the world. Thus, I come to the conclusion that the actual interpretation of resonating events relies on the listener, who becomes the receiver and author of decoding the acoustic message while interacting with the cultural context. This is of course something that cybernetician Heinz Von Foerster repeatedly proclaimed: the listener, not the speaker, determines the meaning of a proposition. When social beings establish a channel of intercommunication, both the listener and the speaker, while interacting with each other, instantiate a conversational milieu and a cybernetic ecology arises. Figure 8 - The ant and the finger. 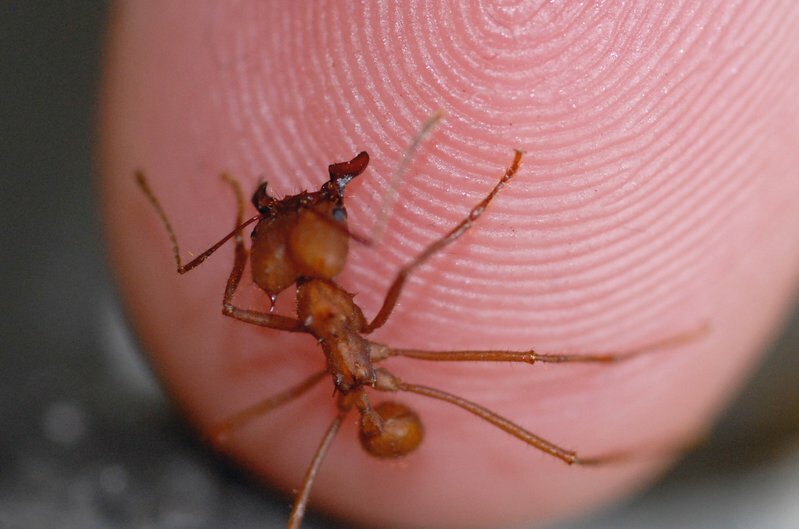 A media ant of Atta cephalotes explores the topologies of my finger. Photograph by Kuai Shen. © Kuai Shen, 2009. Used with permission. The cybernetic application and understanding of bioacoustics has helped me approach the natural phenomena of stridulation in ants to create a complex audiovisual experience that presents an emergent nonhuman social interaction as a resonant acoustic environment. Humans can see potential uses for any natural model. We can approach, embrace, and imagine biological principles and behors through experiments within the fields of bioacoustics and biomimetics and apply them to non-teleological artistic practices. This is the key to understanding my work with ants. Interspecific communication with other social beings is still an unknown territory we need to explore. We need to experience the perceptions and sensorial apparatuses of complex societies that can inspire us. Ants have a troubling relation to humans because of their territoriality and collective superiority, but they have become a scientific utility nonetheless. Our anxiety to alienate them is a result of their non-hierarchical organization challenging our centralized world. We have to stop addressing concepts of superiority or intelligence when we approach other living beings that are social t We should rather see what relationships ants could have to the world of humans and focus on how intense these relations can be in terms of growth, development, and transformation. 0h!m1gas has the purpose of communicating the interrelation of sonic effects in post-human ecosystems based on the related phenomena of scratching as a cultural expression in humans and the phenomena of stridulation in ants as a modulatory mechanism in their self-organization. To this extent, I justify that my artistic intentions toward my research opened a new world of possibilities in terms of perception. But this artistic research still needs to prove itself valuable as a scientific discipline. Of course, on one hand, bioacoustic communication can drive creativity and can potentially stimulate channels for interspecific communication between humans and ants. But, on the other hand, more experimentation is encouraged based on this actual approach with special attention to the objective study of the biological data. How objective can we be in the analysis of biological data when subjects demonstrate more than mere instincts? Drawing conclusions from the study of such a complex subject can become impartial when your research becomes a passion and obsession, rather than an objective analysis. I sympathize with ants and this inspires me to dwell on the passionate expression of art, instead of focusing on the impartial documentation of behaviors. Maybe this is not an issue if your practices are not restrained by science. For this reason, I succeeded in documenting and expressing my results artistically, but I intentionally lacked the scientific rigor to exercise a universal methodology; I admit my approach is anti-Darwinian. My artistic research on the stridulation of ants deals essentially with subjectivity and perceptions. Therefore, the relevant question is how to unbind oneself from the causality of this vicious circle of being inside your own thoughts. I hope that my research serves future generations who want to listen carefully to the environment design new forms of art without the restriction of approaching social beings, especially ants, as subjects of study, but as collaborators in the creation of new ecosystems. According to Roberto Keller, the stridulatory organ occurs at the point of articulation between the third and fourth segments of the ant's abdomen: the scraper or plectrum lies underneath the posterior region of the third abdominal section, while the pars stridens or ridged file surface is located on the anterior part of the fourth section. See Roberto A. Keller, "Homology Weekly: Stridulatory Organ," Archetype (blog), February 9, 2009, http://blog-rkp.kellerperez.com/tag/plectrum/ (accessed March 2011). Bert Hölldobler & E. O. Wilson confirmed that stridulation has been identified in numerous species of the following five subfamilies of ants: Myrmicinae,Pseudomyrmecinae, Ponerinae, Ectatomminae, Nothomyrmecinae. See Bert Hölldobler and Edward O. Wilson, The Ants (Cambridge, MA: The Belknap Press of Harvard University, 199), 257. Bert Hölldobler and Edward O. Wilson, The Superorganism: The Beauty, Elegance, and Strangeness of Insect Societies (New York: W. W. Norton & Company, 2009), 8-438. Ronara S. Ferreira et al., "Stridulations Revel Cryptic Speciation in Neotropical Sympatric Ants," PLoS ONE 5, no. 12 (December 2010), http://www.plosone.org/article/info%3Adoi%2F10.1371%2Fjournal.pone.001563 (accessed December, 2013). Based on recordings of the stridulation of different ant workers of my colony of Atta cephalotes in my studio in the Kunstetage Deutz in ColognGermany. Based on personal experimentation with scratching techniques on the turntable. See also “Dj Qbert's Scratchlopedia Breaktannica,” DVD, direted by DJ Q-Bert, Yogafrog, Syd Garon and Eric Henry (ThudRumble.com, 2007). This can also be viewed on Youtube: http://www.youtube.com/playlist?list=PL9F7CF6FF9BA5CFC8 (accessed December, 2013). 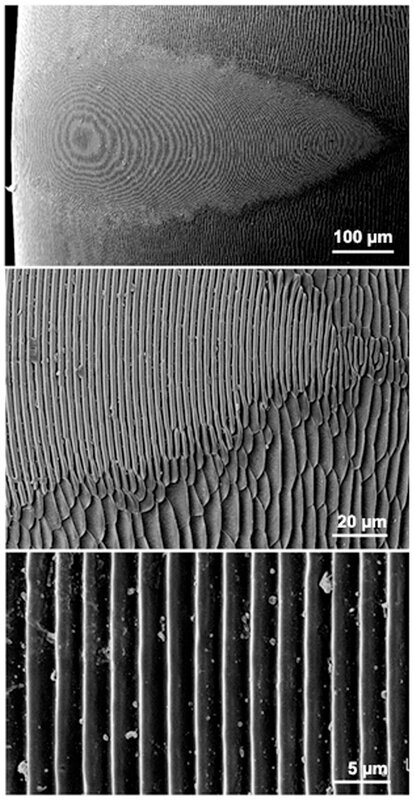 By means of scanning electron micrograph one can see the uncanny similarity between the vinyl grooves and the pars stridens of the ants’ stridulatory organ. See Micrographia, “Biological Agents of Vinyl Degradation,” Micrographia's website, August 2005, ttp://www.micrographia.com/projec/projapps/viny/viny0200.htm (accessed December 10, 2013). Also see Ronara S. Ferreira et al., "Stridulations Reveal Cryptic Speciation in Neotropical Sympac Ants." One of the world's greatest invasion and most detrimental for native species is that of Linepithema humile, the argentine ant in the Mediterranean coast of Europe; it is claimed, the extension stretches for 6000 km along Italy, France, Spain and Portugal. See Matt Walker, “Ant Mega-colony Takes Over World,” BBC Earth News, July 1, 2009, http://news.bbc.co.uk/earth/hi/earth_news/newsid_8127000/817519.stm (accessed October 7, 2012). Additionally see Adam Cole and Brenna Farrell, “Argentine nvasion,” Radiolab, July 31, 2012, http://www.radiolab.org/story/226523-ants/ (accessed October , 2012). Humberto Maturan and Francisco Varela, The Tree of Knowledge (Boston: Shambhla, 1992). Bert Hölldobler and Edwar O. Wilson, The Superorganism: The Beauty, Elegance, and Strangeness of Insect Societes, 206-209. Results are based on my recordings of the stridulation behavior of several Attini ants from the Yasuni rain forest and from my 3 year old leaf-cutter colony in my studio. Furthermore, the recordings were imprinted on a vinyl; as far as I know, this was the first time ant stridulations were produced as a music record. The tracks “A Major‘s Lament” and “The Leafcutters & The Crying Supersoldier” are part of my vinyl record entitled, Stridulation Amplified: compositions with the stridulator organ of Ata cephalotes, which was produced with the support of Kunststiftung NRW in 2012. To listen to the recordings visit my website: http://kuais.tv/stridulationamplified (accessed December 11, 2013). Gilles Deleuze and Félix Guattari, A Thousand Plateaus: Capitalism and Schizophrenia, trans. Brian Massumi (London: Cntinuum, 2004). Gordon Pask and Heinz Von Foerster, “A Predictive Model for Self-organizing Systems, Part 2,” Cybernetica 4, no 1 (1961): 20-55. I combined and designed an executable application using various Max objects based on frame differentiation and pixel features from the computer vision library created by Jean-Marc Pelletier. The application runs in Mac OS X and connects to several analog mini surveillance cameras via Firewire; the data is streamed using a serial-to-USB converter that sends integers to two sepper motors, which are the main motor components of the turntables. For more information about the CV library, please visit Jean-Marx Pelletier's website: htp://jmpelletier.com/cvjit/ (accessed December 11, 2013). See Jean-Francois Augoyard and Henry Torgue, eds., Sonic Experience: A Guide to Everyday Sounds (Montreal:McGill-Queen’s Univerity Press, 2005), 21. Gordon Pask, “The Architectural Relevance of Cybernetics,” in Cyber Reader: Critical Writings for the Digital Era, ed. Neil Spiller(London: Paidon Press, 1969), 78. Heinz Von Foerster, “On Self-organizing Systems and Their Environments,” in Self-organizing Systems, ed. Marshall Yovits and Scott Cameron (London: Pergamon Press, 196), 31-50. Perhaps the first advocate of mutualism regarding the ethologies of inter-species relation was Pyotr Kropotkin. See Peter Kropotkin, Mutual Aid: A Factor of Evolution (New York: over Publications, 2006). This is a recurrent theme in the Bergsonian discourse. See Henri-Louis Bergson, Creative Evolution, trans. Arthur Mitchell (New York: Henry Holt and Company, 1911). The following edition is available online at the Internet Archive: http://web.archive.org/web/20060516195812/http://spartan.ac.brocku.ca/~lward/Bergson/Bergson_1911a/Bergson_1911_toc.html (accessed December 11, 2o13). The very first prototype of the installation was produced with the support of the Academy of Media Art Cologne during 2008. I did the research and programming in Lab III and in the department of video/interactive dramaturgy & scenography. Thanks to Jean-Marc Pelletier for creating and sharing with the world his CV library for Max Jitter. For images and video documentation on 0h!m1gas, please visit: http://kuaishen.tv/0hm1gas. Kuai Shen is an insect media artist and researcher from Ecuador. He holds a BA in digital arts from University San Francisco de Quito, an MA in media arts from the Academy of Media Arts Cologne, and an MA in Game Design and Development from the University of Applied Sciences Cologne. He has exhibited internationally at media art festivals, galleries and biennials in Germany, Belgium, England, Slovenia, Italy, Mexico, Canada and China, as well as participated in important European symposia. Kuai Shen has published his research with ants in a book entitled Biologically-Inspired Computing for the Arts from the University of Colorado and in the Leonardo MIT Journal for the Siggraph. His artistic approach to self-organization and emergence is envisioned in audiovisual installations that reflect on interspecies artistic collaboration with ants and the metaphor of a post-human ecology, an ecology whose future lies in the communication between species and the mutualism between technological media (human artifacts) and insect media (biological organisms). His current research focuses on ant mimicry in the post-biologic technology of humans based on phenomenology, resilient networks and mimicry. In 2013 he won the Edith-Russ-Haus Medienkunstpreis and received an honorary mention in hybrid art from the Prix Ars Electronica.